Legal sized holders fit both 3-ring and 4-ring legal binders. Extra durable heavyweight sheet protectors provide permanent storage for frequently used materials. 14 x 8 1/2, Legal size. Photocopies won't stick. No sheet punching necessary. Acid-free. Clear finish. 50/BX. Legal Size Document Storage --- Legal size sheet protectors are larger than letter size sheet protectors and made to accommodate 14 x 8-1/2 documents. 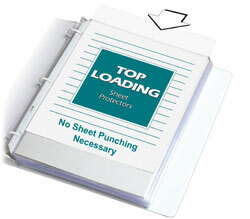 Legal size sheet protectors are 7-hole punched to fit in 3-ring or 4-ring legal sized binders. These larger size sheet protectors allow you to store legal size documents in their original form without having to reduce them to an 8-1/2 x 11 size. Seven-hole Punched --- Sheet protectors are four-hole punched to fit in legal size three-ring or four-ring binders. Sheet Protector Special Features: Acid-free sheet protector eliminates photocopy transfer and has clean hole punches making it easy to load into a three-ring binder. Suggested Use: Extra durability for permanent storage of important materials.